We love fresh oysters on a half shell served on crushed ice with lemon wedges in the summertime! There isn’t a better place to sip on a glass of wine and enjoy oysters on a half shell then on the waterfront of Nantucket. If you are craving fresh oysters then you’ve come to the right place. Nantucket Island is surrounded by the beautiful Atlantic Ocean which provides our islanders and visitors with an abundance of delicious seafood. Plus who doesn’t love fresh seafood when they’re vacationing on an island? Consider shucking your own and head on over to the Glidden’s Island Seafood where all the locals shop. This local fresh seafood market has been Nantucket’s Finest Fish Market since 1898. They offer the finest selection of Cape Cod steamer clams, P.E.I. mussels, Nantucket oysters, and Nantucket Bay Scallops. Glidden’s has a holding tank for live lobsters and they will gladly cook them for you with a phone call and during the summer season they offer lobster clambakes to go! Nothing makes us happier than fresh seafood for dinner. 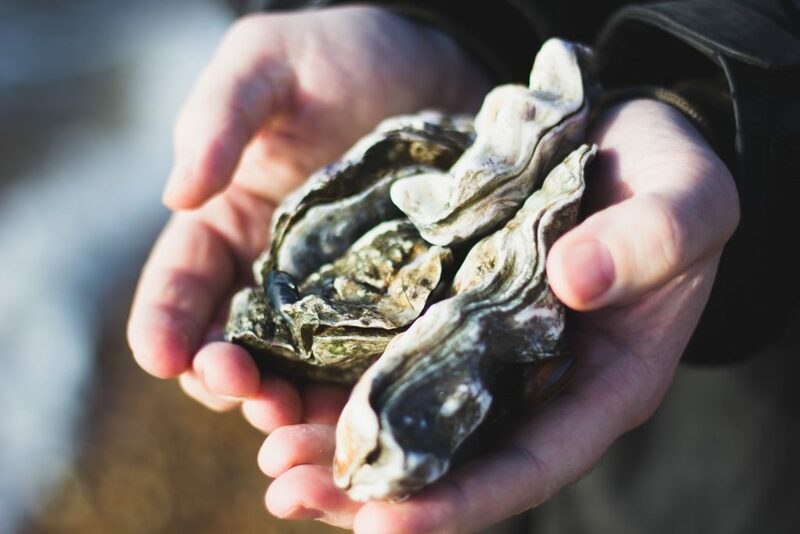 If you’ve ever had fresh oysters you know that you need two very important items – cut proof kitchen gloves and a quality knife that can get between the two shells and hold up to a good twist and wrist turn. Shucking your own is an affordable way to enjoy oysters on Nantucket at home or with friends but does requires a little skill. If you are a newbie then you will want to order a shucking knife and some chainmail shucking gloves so you don’t hurt yourself. You can also purchase a shucking knife at the local market. After you open a few, you’ll get the hang off it and you’ll be a pro in no time. Lastly, you will need some crushed ice, fresh lemons, and a bottle of wine to enjoy the makings of a fantastic evening of fresh seafood! 1. Rinse a bag of freshly harvested oysters under cold running water to remove grit and then place in ice for 1 hour. 2. Put on a set of Chainmail Shucking Gloves. These Cut Resistant Gloves are a best seller on Amazon and are more affordable. 3. Place an oyster in one protected hand with the rounded cup side down in your palm and the narrower hinged point toward you. 4. 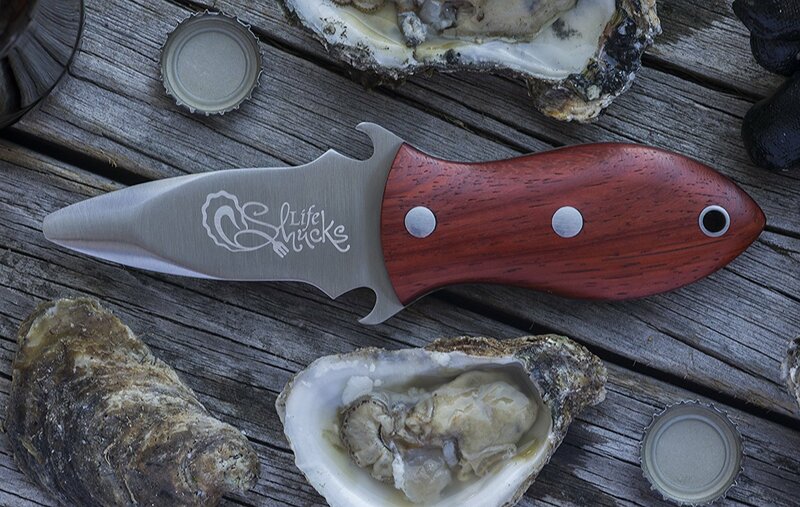 Grab an Oyster Knife (pictured above) with your other hand. insert it into the hinge, just between the shells, and, with gentle pressure, twist the blade to prop the shell open. This one is also a very good Oyster Knife and is great for popping even the most difficult hinges open. 5. Run the blade over the meat along the top of the shell to server the oyster from its top shell. 6. Continue using a twisting motion to separate the top and bottom shells. 7. Lift off the top shell and discard unless you want to save them for a cool DYI project. 8. Cut under the oyster to release it from the bottom of the shell, being careful to keep as much liquid in the shell as possible. 9. Serve the opened oysters on a bed of crushed ice displayed on an Oyster Serving Tray. Repeat steps 3-8 until you shuck enough for everyone. 10. Lastly, garnish with fresh lemon wedges, a little parsley, and some delicious dipping sauces.